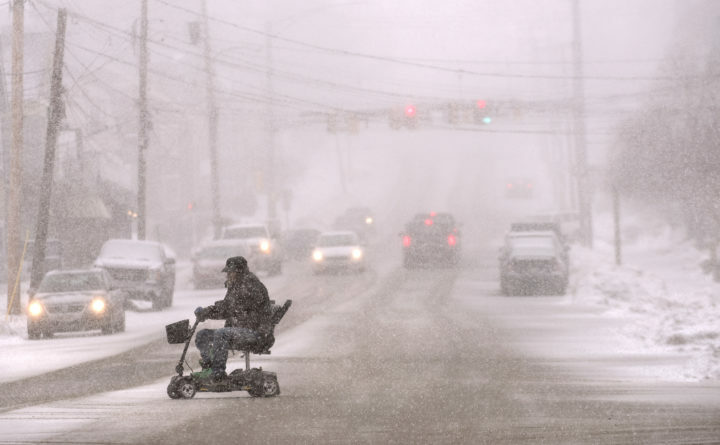 A man rides an electric wheel chair on Union Streer as heavy snow falls in Bangor in March 2018. Meteorologists say a light snow storm set to hit Maine on Sunday afternoon will likely turn to rain and sleet in the evening, potentially causing icy driving conditions on Monday morning. In southern Maine, National Weather Service forecasters predict the snow will begin around noon, with a total accumulation of around 1 to 3 inches. It will continue through the afternoon before starting to mix with rain after 3 p.m. Snow should switch to all rain after 11 p.m.. A high of 46 is expected for the Portland region on Monday, with wind gusts up to 25 miles per hour. In western Maine, where the precipitation will likely stay snow, the mountains will get 3-6 inches. In eastern Maine, snow is expected to start around 3 p.m., with a total estimated accumulation of around 2 to 4 inches, according to the NWS. The snow is expected to turn to sleet or freezing rain in the evening and overnight. Monday morning’s commute may be quite slippery along the coast, in the Bangor region and in Aroostook County. By midday Monday, temperatures will rise into the 40s, however, and it’s expected to be sunny most of the day.